How Do You Get Rid of Boils? Skin: Are Hypoallergenic Cosmetics Really Better? What Are the Side Effects of Taking Antibiotics Long-Term? How to Tell If Your Red Skin Is Rosacea? Can Dermabrasion Cure Acne Scars? Is it Safe to Use Accutane for Acne? 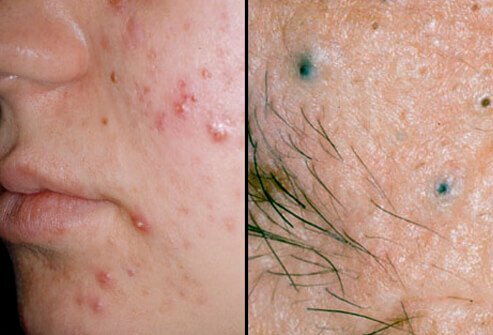 Health Tip: Can't Clear Your Acne? Acne's Silver Lining: Slower Aging of the Skin? Are Tea Tree and Lavender Oils Safe for Kids? Are People With Rosacea at Higher Risk for Alzheimer's? Could a Vitamin Play a Role in Acne Outbreaks? Can You Treat Acne With an iPhone App? Acne: Toothpaste as Zit Zapper? Acne: Can the Pill Clear Up Bad Skin? Cosmetic Laser Surgery, Is It For You?